Writer, editor, and occasional DJ. 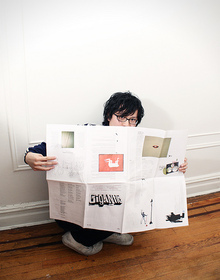 Founding editor of Gigantic (http://thegiganticmag.com/), a magazine of short prose and art. My work has appeared in NOON, Fence, Tin House, Vice, PEN America, the anthology 30 Under 30, and elsewhere. Born in Anderson, South Carolina, I now live in Brooklyn, New York. Bolaño, Borges, Frank O'Hara, Kafka, Duras, Proust, Yoko Ogawa, Lydia Davis, Julie Hecht, Robert Walser, Thomas Bernhard, Flannery O'Connor, Haruki Murakami, Knut Hamsun, Clarice Lispector, Tao Lin. Oh and I loved this line -- "At the station for a moment I considered getting on too, riding out of my way so we could keep talking, a habit of mine, prolonging things, sometimes too far." Well done. oh, yeah, from THAT place, that is even funnier. I was thinking of the other journal. By the by, read "Some Kind of Change". Nice placement! What's up with the Pen Petition guy/gal? Ha, before you write another word you need to ride a Greyhound bus. Thanks, James, and I'm always looking for rejections. Sometimes, like now, when days go by without a response of any kind, I hope and pray for even a Lee Klein-beatdown type rejection. I presume that is normal. Maybe I shouldn't ask. Cool to have you with us. You must log in to write on James Yeh's wall.